Deep fall invites cozy stillness, and an appreciation of fabrics. Quilts and other textiles soften the darkness. Baskets hearken back to close-to-the-earth times. Creating them is a meditation. Too often, their functional use, for example, what we stand on or sleep with, overshadows the true artistry of textile crafts. In Milton, Massachusetts, I wandered through an eclectic art exhibit,“Standing on Stories,” at the Milton Art Center, which highlights weavings, quilts, rugs, sculptural baskets, multi media, knitted and felted works of art. In the late afternoon darkness, the textiles brought a feeling of comfort. “Standing on Stories” represents a bridge between a craft’s history and the artist’s imagination to form a tactile record of personal journeys. Every woman has a story behind her creation, imbued with her touch. Mairead Dambruch of the Milton Art Center curated the works of seven local female artists: Alexis Agbay, Line Corcoran, Debbie Elliot, Nina Ennis, Virginia Holloway, Kathleen McDonough and Ellen Solari as visual narrators of modern times. Did such creativity provide an escape from stressful times? Does an artist experience meditation differently based on her craft?? Weaving goes back to colonial times, and Debbie Elliot of Milton, age 54, a self-taught artisan, has practiced the traditional craft for ten years. For her, weaving cloth and creating rugs offer a peaceful refuge. She said, “Organizing strings in a certain way, into a pattern, is a meditative practice. It brings me to a place of centeredness and shuts out the chaos.” Elliot loves the sound as the weaving shuttle flies back and forth across the threads, her floor loom keeping rhythm as colors and patterns emerge. “The shuttle sound is ker-thunk, ker-thunk, like an old typewriter,” said Elliot. To teach others to weave on a floor loom is the next step in her creative process. 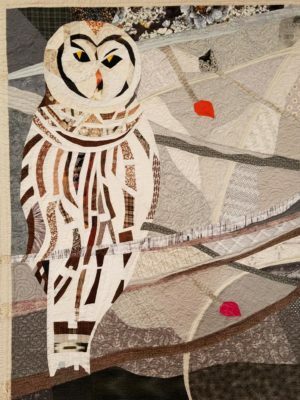 “Snowy Owl” is a quilted wall hanging that took Line Corcoran of Milton two years to complete. The soothing wintry tones are a perfect backdrop to the arresting gaze of an owl. Serenity for quilter Corcoran, age 50, is reached within the solitude of her sewing room where she began quilting in 1998. She said, “It’s a visionary journey, watching the subject unfold, and how the next piece of fabric gets chosen. I audition each little piece. I step back and find the perfect fit. That becomes my world for a time, an immersion in colors and shapes.” Six of Corcoran’s works are featured in the exhibit, but she describes herself as a “closet quilter” because she rarely displays her art in public. In the darkening afternoon, the sight of handmade textiles wrap my spirit in warmth. This column ran in The Patriot Ledger (MA) and nationally through GateHouse Media, 11/5/2018.